I also got to meet Xchyler staff and authors in person, and that on its own did more than anything to give the feeling of being part of a team. The coolest part, and also the scariest, was the panel with those same Xchyler authors. YES, GUYS, I WAS ON A PANEL! And in case you’re saying Picture! Or It Didn’t Happen!, you can see one by clicking here; from left to right: Lissa Gilliland, Candace Thomas, McKenna Gardner, me, Anika Arrington, Scott Taylor. I don’t do well when talking to crowds of strangers, but thankfully (1) I wasn’t the only one—because other Xchyler authors were there, there was a feeling of all being thrown into the deep end together, and (2) I wasn’t expected to speak for more than three or for minutes, which is good because if it had lasted any longer I would probably have lost it big time. We were asked to introduce ourselves, and talk a little bit about our experiences as Xchyler authors, and also mention our current Works In Progress—which meant that I was able to say a little bit about Mr. Gunn & Dr. Bohemia to about fifty people who were in the room, thereby raising a little bit of awareness. Since I went in with only a vague idea of what was expected, I had no script; I really did have to think on the run. I think I did ok—Kate said I did pretty good, and so did Scott Tarbet, Xchyler’s Man Of Marketing and Master Of Ceremonies. All in all a fantastic day. Stay tuned for the next post, in which I hope to have a bunch of Kate’s photos of the event. Until then . . .
Off to Salt City Steamfest, that is. Twenty-four hours from now, we’ll be . . . still here, actually, because we’re not planning on leaving until around midnight, give or take an hour or so. Right now we’re sorting out dinner, then once we’re fed we’ll be gathering the stuff we’ll need for the trip. Usual stuff, of course—clothes, camera, laptop, maybe my tablet, boots in case the weather turns wet. 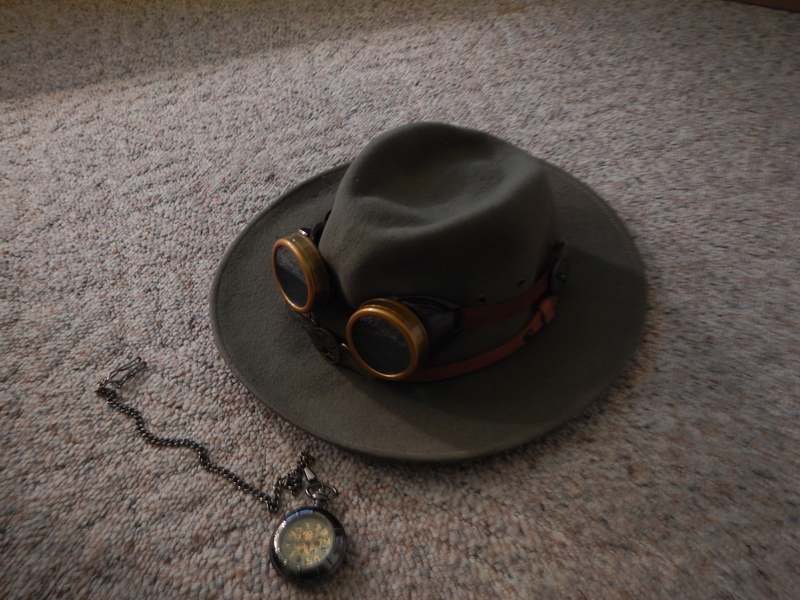 I wish I had some steampunk gear, but I may have to resort to buying some small items when we get there (there won’t be any $200 hats, though). It’s exciting. We haven’t been on any trips anywhere recently, so this is going to be a nice break, even if it is short. I’ll be around the Xchyler stall/booth/table/whatever, most of the time, and I expect Kate will be wandering around the hall with her camera. I should be on a panel for a short while, too. I’ll be tweeting, and if there’s wi-fi I may be posting here or on Facebook. I have to cut this short—time for dinner. More later.